In 1947 Piper Aircraft made a deal with Lee. They would give him a plane (a J-3 Piper Cub) if he would make a promotional film about flying and Piper. This was just what Lee wanted: a plane and learning how to fly. He had only a few weeks to learn before a new season at his camps in Newfoundland was to start, so that’s what he did. He learned how to be a pilot and then flew off to Canada. Here he is getting instruction after he took possession of the plane at the Round Lake Seaplane Base in upstate New York. A number of interviews with people who knew, were relatives of, worked with or were friends with Lee or Joan have already been shot, with many more to be completed in the next few months. Henry Leon Wulff was an artist, an inventor, an explorer, an author, a pilot and a filmmaker. Lee was born in Valdez, Alaska in 1905, where his father had gone to strike it rich in the gold fields – a goal that didn’t quite pan out. Lee was in Valdez for 10 years, where his father, Charles Wulff, had become the owner/publisher of the local newspaper. The family then moved back to Charles’s hometown of Brooklyn, New York for five years before finally settling in San Diego, where Lee graduated high school and, for two years, attended San Diego State College. After being a star athlete and an excellent student in San Diego, Lee transferred to and, in 1926 graduated from, Stanford University in Palo Alto, California. He earned a degree in engineering, but had no intention of being an engineer – Lee got that degree to please his father. In fact, the day after graduation, Lee scraped up what money he could and traveled to Paris to take art classes. Lee saw himself, as others did as well, as an artist – a painter and a sculptor. 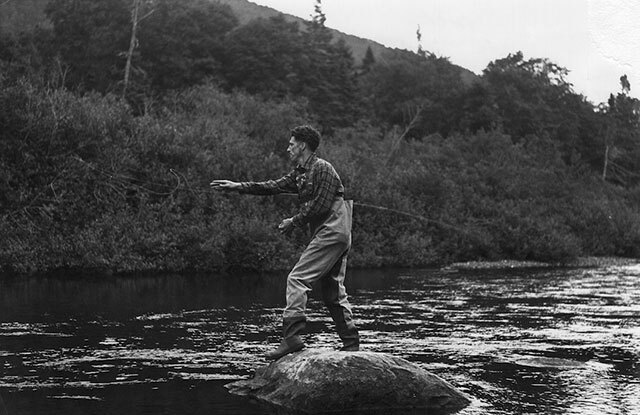 Up until the 1940s, the common belief among fly fishers was that to cast to, hook, play and land an Atlantic Salmon, one needed to use a strong, and a long, two-handed fly rod, 12 to 15 feet in length. In 1943, Lee Wulff cast his line and fly using only his arm, hooked, played and landed a good-sized Atlantic salmon without any rod at all. After more than a year in the City of Light taking classes and hosting exhibitions of his work, Lee moved to New York City where he served as an art director, primarily in advertising. But the pull of the outdoors, fishing and hunting was always luring him to lead another life. After dipping his toe in the water by writing articles and taking photographs of life in the outdoors, Lee decided to quit working for other people and devote his life to making public appearances, writing, photographing and filming adventures in the outdoors. He became a worldwide figure and was the person who, in 1939, wrote that a gamefish is too valuable to be caught only once, thus originating the concept of “catch-and-release.” He also was constantly challenging old and, as he proved, outmoded and often times completely false ideas and beliefs. In October of 1946 he debunked the accepted notion that if you fell in a river while wearing full waders and they filled with water, you would drown. While wearing full waders, he dove from a bridge into the waters of the Battenkill River in the Catskills, allowing his waders to fill with water, and then spent a good while swimming around and waving to people before he walked out of the water. And there are pictures to prove it. He also debunked the myth that, in order to cast to, hook, play and land an Atlantic Salmon, you needed to use a long, strong two-handed rod. He knew better; he believed that not only didn’t you need a strong, long rod, you didn’t need a rod at all. He stood on a rock in a river in Canada, and, using only a reel with a line on it – no rod at all – he cast with his arm, hooked an Atlantic salmon, played it and landed it using only his arm, hand and the reel with a line on it. And he had someone take pictures of the entire event. 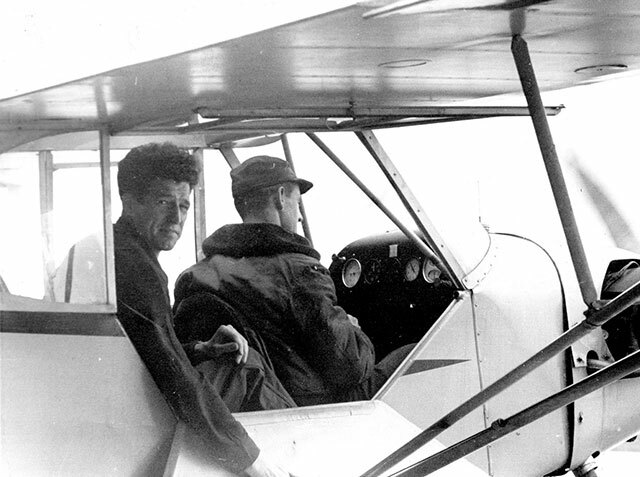 In 1947, and in only a few weeks, Lee learned to fly a plane after taking possession of a J3 Piper Cub and, for the rest of his life, flew around North America, exploring, opening camps and lobbying countries on conservation, ecology and the protection of wildlife. He invented gear from reels to lines to landing equipment. He was a producer, a director, and a writer of not only books but also of television shows. (And he did all this while being married five times – he was definitely a busy man.) He also set world records for hooking and landing different species of fish. As many people have stated, Lee Wulff was the outstanding outdoorsman of the 20th Century. 1945, when Joan Wulff was 18-years- old. The American Magazine ran the first national story on her titled “No Flies On Joanie,” and she was shown walking a country road, preparing a fly to fish, fishing and playing a fish and teaching younger teenagers. 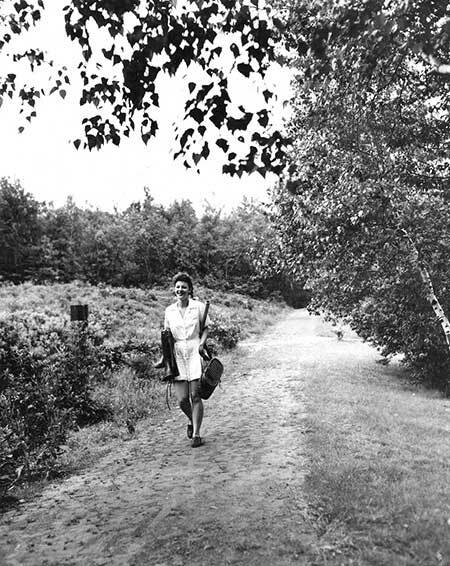 Joan Wulff was born in New Jersey in 1926, where her father owned a sporting goods store and was an outdoor columnist for the local newspaper. At ten years old, Joan wanted to learn to fly cast and after a humorous “first cast” beginning, she practiced with determination and won her first statewide casting tournament in 1937. She went on to win 17 different national casting titles and in 1987 wrote the first book that clearly and understandably broke down the elements of successfully casting a fly line. She also fished around the world and became one of the most admired, honored and loved casting teachers of all time. Joan actually started teaching dancing when she was still a teenager; this is when she realized that her love of teaching could become her life’s passion. After a few years of partnering and running a busy dance studio, Joan decided that she wanted to leave a safe and predictable career in teaching dance to try a more exciting life in fishing and the outdoors. She traveled the country representing line and fishing gear companies, while also appearing and demonstrating casting at many of the large sportsmen’s shows that were held throughout the United States. She had met Lee Wulff a couple times in the fifties, but those meetings were fleeting. However, in 1966, Lee was set to film a television show, American Sportsmen, with the popular singer Kay Starr, but Starr had become ill and Joan was asked if she would step in to appear with Lee. Lee wanted a woman to fish for giant bluefin tuna in Newfoundland waters and catch one that weighed five times her weight. Even though Joan knew she could become seasick and having heard that Lee was somewhat of a hermit, she surprised herself when she agreed to the request. After ten days of fishing and filming, both Joan and Lee knew they wanted to be together. (And Joan did not get seasick – the waters they were on stayed calm the whole time and Joan did catch a bluefin tuna that weighed five times her weight.) Joan and Lee tied the knot a year later in 1967 and began a 23-year marriage that influenced the teaching and story-telling of outdoors sports and adventures that helped promote conservation, fly fishing and the importance of ecology. 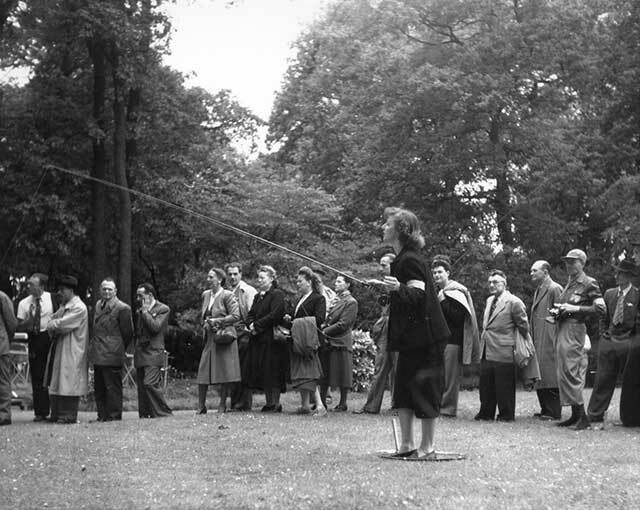 In 1948, Joan was asked to travel to Paris to demonstrate at the Bois de Boulogne “Little River Event” in Paris. This was the first time the event had been held since the end of World War II, and she attracted a crowd whenever she performed. In 1979, Joan and Lee opened the Wulff School of Fishing in the Catskill Mountains of New York, where it became famous for its high quality and for hosting students from around the world. To this day, the school continues to operate and attract many students each spring. Joan went on to write three more books that help people understand not only casting, but the sport of fly fishing as well. And this “first couple of fly fishing” appeared together lecturing as well as appearing in many films that Lee was making for their own lecture appearances, as well as for the ABC and CBS networks. Joan and Lee traveled the world demonstrating, fishing and filming, always returning to their home base and school in Lew Beach. It was during a weekend school in late April of 1991 that Lee left the students on a Sunday morning in order to renew his pilot’s license when he had a stroke and died at the age of 86. If anyone has photos or film clips of either Lee or Joan that they think should be considered for inclusion, please contact the film’s director of research, Stephen Jones, via email. Frank Schurz is serving as executive producer of both the Lee Wulff film and the Joan Wulff film. Schurz is a retired media executive and currently active in a number of conservation organizations, including the Atlantic Salmon Federation, Trout Unlimited and Ducks Unlimited. Schurz has been instrumental in securing the investment for the combined budgets of the three Wulff Project films. Doug Kluthe is bringing his 25-years of experience in film distribution and TV licensing to his duties as the executive producer of “The Best of the Lee Wulff Films” and as the executive in charge of production of the two documentaries. Kluthe will oversee the digital distribution and platforming of all three films. The director of research and associate producer is Stephen Jones, who was, until last year, head of access services at Beinecke Library, Yale University, New Haven, Connecticut. Jones recently retired from Beinecke, but in 2010, he was the curator of the successful exhibit “Lee Wulff” that ran for three months. It was then that Jones became very familiar with, and enthused about, helping to produce a film focusing on Lee and a separate film on Joan. The director of photography for the projects is Robert Hanna, who has a thirty-five year history of serving as a DP. Hanna is highly sought after and has worked in that position on shows for National Geographic, NOVA, the BBC, The Discovery Channel, NBC and ABC. His awards include a national primetime Emmy for cinematography that he won for his work on “Carrier,” a ten-hour series that was shown on PBS. Post-production Supervisor and Editor is Richard K. Allen who has worked on hundreds of productions for networks, studios and independent companies. His credited shows include “Extreme Surgery” for the Discovery Health Channel, “Growing Up Lion, Growing Up Tiger” for Animal Planet, a special documentary, “The Lord of The Rings: the Quest Fulfilled,” and “The Three Stooges – 50th Anniversary,” a special for NBC.